Campaign Complete. This project has ended on October 31, 2017. No more contributions can be made. All funds will be collected by October 31, 2017. Hello! We are UrbanTundra, a high school research team competing in the 2017 International Genetically Engineered Machine competition, otherwise known as iGEM. Our team is composed of 15 students from schools including Harry Ainlay, Old Scona Academic, Lillian Osborne and Archbishop MacDonald. We are brought together within this team by our passion in STEM! The competition enables us to explore the practical applications of synthetic biology in solving real world problems. 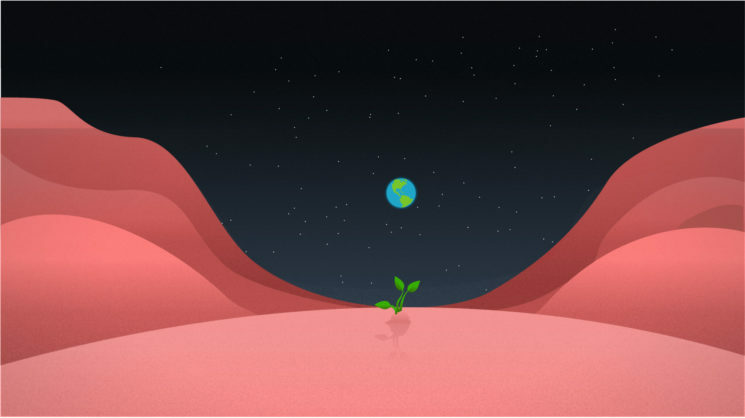 This year, our goal is to genetically engineer E.coli in order to break down toxins present in Martian soil. With a lot of trial and error, we plan to aid in the advancement of science and human colonization of Mars.The 2016 season ended with us winning Best Wiki, Best Poster, and Best Presentation at the iGEM Giant Jamboree in Boston - we excitedly await for what the 2017 competition has to offer! At £3, you will receive a set of decal stickers that feature science-inspired designs made by our team! These stickers can be used on laptops, notebooks or anywhere that needs a little creative boost. In addition to a set of decal stickers, this donation tier includes a team picture postcard signed by all of our members, thanking you for your generous contribution. Donating £30 adds a custom-designed baseball hat on top of the previous tiers’ incentives. This hat will feature another unique design from our team and can be made with a plethora of different colours. Again, donating at this tier will net you the incentives of the lower tiers. However, donating £60 will grant you a one-on-one with the team via video messaging platform as well as a special shout out on our team’s wiki! Plus, you will recieve images of Mars in postcard form! The highest donation tier includes all of the previous incentives plus a customized name plaque! Our team will personally design, 3D print, and hand paint a customized plaque adorned with your name. In 2009, NASA’s Phoenix lander identified traces of perchlorate in Martian soil, an ion which is toxic to humans and also inhibits plant growth. This will prove to be a major barrier towards the future colonization of Mars. 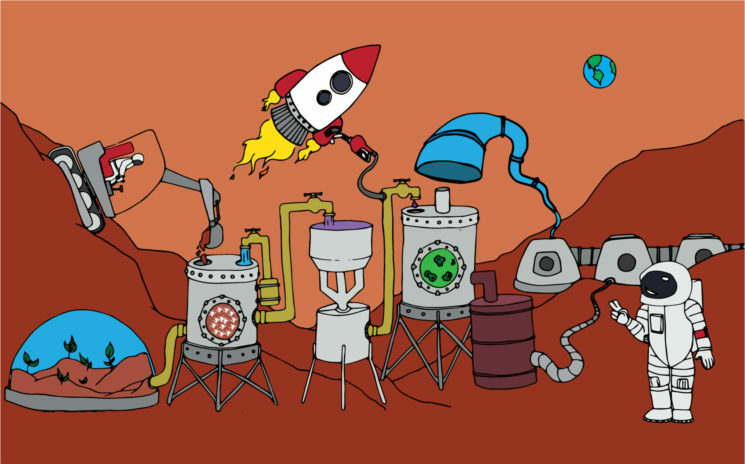 Our team’s project focuses on remediating Martian soil and finding a sustainable method of breaking down this toxin: using synthetic biology, we will engineer bacteria to break down perchlorate ions into oxygen and chloride, thereby detoxifying the Martian soil. In order to complete our desired tasks, we must produce specific enzymes (proteins that can speed up biochemical reactions): perchlorate reductase and chlorite dismutase. In tandem, these enzymes work together to break down perchlorate ions into oxygen and chloride ions, its core components. We have chosen E. coli to produce these enzymes,as it is the easiest carrier and the most researched bacteria available. After synthesizing and integrating the DNA sequence of the two genes for these enzymes into E. coli, this will allow for the breakdown of perchlorate into oxygen and chloride ions and thereby resolve the issue of perchlorate contamination of Mars through the genetically engineered E. coli. As our project’s primary goal is to be utilized on Mars, our research and engineering teams will prototype a self-contained bioreactor, a system that uses living organisms to carry out a biological process/reaction. In our case, we will design and construct a bioreactor that is able to extract perchlorate ions from the soil and expose these perchlorate ions to perchlorate reductase and chlorite dismutase to break it down. Theoretically, our bioreactor would undergo a process in order to create these two enzymes: first, we separate perchlorate ions from the soil. Following this, the perchlorate ions are made into a solution which can be converted to oxygen and chloride ions by our enzymes. Finally, the leftover waste will then be used as fertilizer for agricultural possibilities. While we are researching the feasibility of our project for use on Mars, we will also be looking into perchlorate contamination on Earth. How does this add to what we know? Our project will expand current knowledge on addressing perchlorate contamination, not just on Mars, but on Earth as well. Technologies do exist for the removal and reduction of perchlorate, but the majority are costly and take a long time. By constructing a system that reduces perchlorate biologically, we can compare its cost and speed to existing processes, expanding the avenues available to deal with perchlorate contamination. Furthermore, as use of the perchlorate reductase gene in bacteria has been explored only by a few research groups, our team’s research will add to the small pool of knowledge regarding this particular gene. As technological advancements bring the concept of space colonization closer than ever before, exploring technologies that would facilitate colonization beyond our own planet becomes increasingly important. When looking at problems that exist beyond our atmosphere, considerations such as transportation and sustainability are brought into the forefront. These limitations push our team to think creatively for our project in order to address these problems. In turn, it will breed innovative solutions that could be used in the future. In addition, research into solving problems that we would encounter in space may also produce solutions for issues that we deal with on Earth. Perchlorate contamination exists on our home planet as well, with the majority of technologies used to break it down being extremely costly. Essentially, our teams research of perchlorate with regards to Mars lends itself to solutions for perchlorate on Earth. We hope that our work can be used to address this toxin on both planets. As a team led by students, we believe that the importance of fostering interest in STEM in younger generations should be highlighted. We hope that our efforts as a student-driven research team will show that passion for the STEM fields can push forward innovation in our world. Our main goal is to express the perchlorate reductase gene in E. coli in order to complete the metabolic pathway for perchlorate reduction. From there, we aim to test out the effectiveness of the entire biological system and determine the strengths and weaknesses of this design. We will achieve this through constructing a prototype bioreactor. This bioreactor will contain living organisms – in this case, our genetically modified bacteria – which will carry out the reaction that breaks down the perchlorate ion into its basic elements, oxygen and chlorine. Furthermore, we are exploring ways in which waste from our biological system could be used in other applications. We plan to explore this by constructing a hydroponics farm to test how waste from the bioreactor can aid in the sustainability of other resources. At the end of it all, we aim to present our work at the Giant iGEM Jamboree in Boston, United States where teams from all around the world showcase the work that they have done over the course of the iGEM season. Following the competition, we will do a live webinar for all our backers on the results where we can answer questions and talk about our iGEM experience. We require a number of materials to conduct our research. For our lab research, materials such as DNA sequences, chemical reagents, and disposable labware are some items that we need to purchase. As well, we need materials to build our hydroponics setup and our prototype bioreactor. To attend the competition, our team needs to pay a registration fee for each member attending. If we are able to complete our main goal to cover the research materials, the additional funds raised will go towards covering this cost. The more we are able to fundraise, the more members we can send! 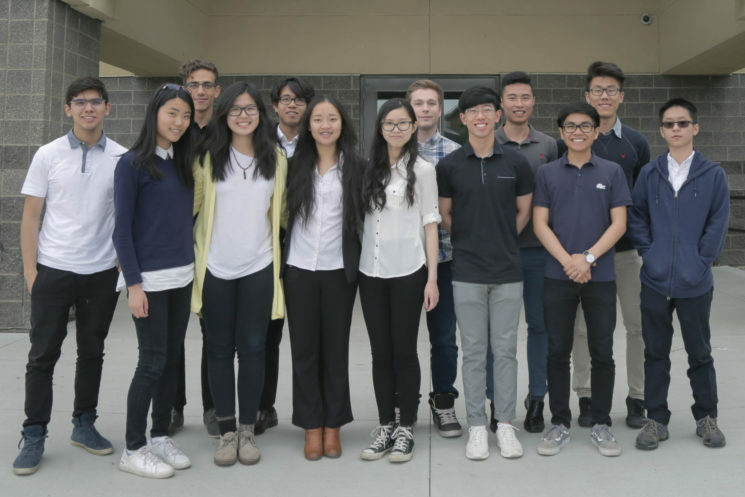 Our team is composed of high school students from all around the city of Edmonton, Canada. We are a student-driven research team composed of individuals that have talents in a number of diverse fields; biology, engineering, media production and public speaking are just a few of these disciplines. The competition that we are participating in is the International Genetically Engineered Machine (iGEM) Competition, the premiere synthetic biology competition in the world. Working with professors and advisers, our goal is to conduct research and present it at the Giant iGEM Jamboree in Boston, United States. Ejouan Agena: EJ is a recent IB diploma graduate from Archbishop MacDonald High School, and will soon be beginning his first year in Engineering at the University of Alberta. By working in a new environment, he hopes to cultivate his interest for STEM as he develops practical research skills through first hand lab experience alongside his teammates. Derrick Zhang: Derrick is a recent graduate from Archbishop MacDonald High School. He will be attending the Faculty of Science at the University of Alberta this upcoming fall. Compelled by the work of UrbanTundra, he decided to join the team for the sake of aiding in the progression of the team’s research, learning more about synthetic biology as he goes on. Tracy Vuong: Tracy is a student currently attending Archbishop MacDonald High School and will be beginning her senior year this September. She decided to join UrbanTundra due to her interest in synthetic biology. Being the youngest member of the research team, Tracy strives to learn more about synthetic biology, and experience this learning process within a competitive setting. Jing Huang: Jing is a recent IB diploma graduate from Old Scona Academic High School, and a member of the research team. Focusing on the research potentials that iGEM has to offer, Jing hopes to fine tune her leadership and collaboration skills, as well as deepen her understanding in the field of synthetic biology. Andrew Wu: Andrew is a recent graduate from Old Scona Academic High School, and will be working towards a Bachelor of Science at the University of Alberta this upcoming fall. He enjoys the idea of gaining laboratory experience through the iGEM competition, while at the same time, satisfying his own passion for science. Joshua Cruz: Josh is a recent graduate from Archbishop MacDonald High School, and will soon be attending the Faculty of Engineering at the University of Alberta this fall. Driven by his desire to learn more about the universe and his overwhelming curiosity of space, UrbanTundra’s goals within iGEM create the perfect environment to cultivate Josh’s interests. Carson Plamondon: Carson is a recent French immersion graduate from Archbishop MacDonald High School, and will be pursuing a degree in Engineering at the University of Alberta this upcoming fall. He joined UrbanTundra mainly due to his interest in applied science, hoping that the competition would serve as a means of satisfying his curiosity in synthetic biology. Abel Negatou: Abel recently graduated from Archbishop MacDonald High School, and will be attending the Faculty of Engineering at the University of Alberta this upcoming fall. When asked of the reason of his participation in the iGEM competition, Abel claims that it is an excellent opportunity for him to learn of a subject he knows very little about: such as genetic engineering. Christian Montiel: Christian recently graduated from Harry Ainlay High School. This is Christian’s second time participating in the synthetic biology competition along with the team, UrbanTundra. He wishes to once again experience the variety of academic activities that iGEM is composed of. Manvir Jutla: Manvir recently graduated from Archbishop MacDonald High School, and will be entering the Faculty of Engineering at the University of Alberta this upcoming fall. Manvir was recruited mainly due to his experience in web development and this will be his second year in the UrbanTundra team, participating once more as a Wiki developer. Britney Trieu: Britney is a recent graduate from Old Scona Academic High School. Majoring in Math, she will be pursuing a Bachelor of Commerce degree at the Campus St. Jean this fall. As part of the outreach team, Britney plays a vital role in communicating with individuals within the STEM fields, contacting other teams, while also raising the funds necessary to support the team’s needs. Claire Duong: Claire is a recent graduate from Old Scona Academic High School, and has her eyes set upon pursuing a career in nursing at the University of Alberta. Claire works alongside Manvir on the construction of the Wiki, whilst creating quality puns and astronomical edits for the team Twitter page. Ethan Chua: Ethan is a recent IB diploma graduate from Archbishop MacDonald High School. In the upcoming fall, he will be attending the University of Alberta in the Faculty of Engineering.. Ethan wishes to experience synthetic biology in its entirety by joining the multifaceted competition of iGEM. Taishi Ito: Taishi is a student attending Harry Ainlay High School and will be beginning his senior year this September. Seeking to expand his horizons in the STEM field, Taishi decided to join the team in order to garner insight into one of the future prospective fields of study in a post secondary setting. Again, donating at this tier will net you the incentives of the lower tiers. However, donating £60 will grant you a one-on-one with the team via video messaging platform as well as a special shout out on our team’s wiki! Plus, you will receive images of Mars in postcard form!